Let us provide you with a cutting-edge facility that will give you the flexibility to change with the industry when you are ready, at your own pace. Our tanks and equipment are rated to handle traditional fuels as well as biofuels and E-85. We design your layout and infrastructure to allow for the future installation of alternative vehicle accommodations such as electric vehicle charging stations. are going out of business? We still need traditional gasoline and diesel and they are not going away anytime soon. A lot of gas stations are being abandoned because the market is changing. Traditionally most gas stations have been owned or branded by the major oil companies. Today, those giant companies are getting out of the retail petroleum market to focus on exploration, extraction, refining, and wholesale supply. Some of the stations being sold are being rebranded and upgraded. Some of the stations are being demolished to make way for non-petroleum business like banks, fast food, and convenience stores. 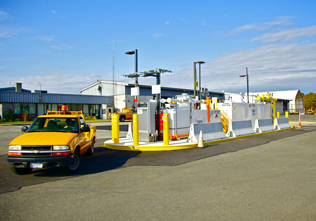 Don’t let the changing industry keep you from building your fueling facility. Just be smart about it. Get a turnkey, design-build solution that lets you seamlessly integrate new technologies as the market adapts.